What is a Colorado Living Will? Colorado Living Will: What Is It? A Colorado living will is a legal document that you complete to explain your wishes related to medical care. 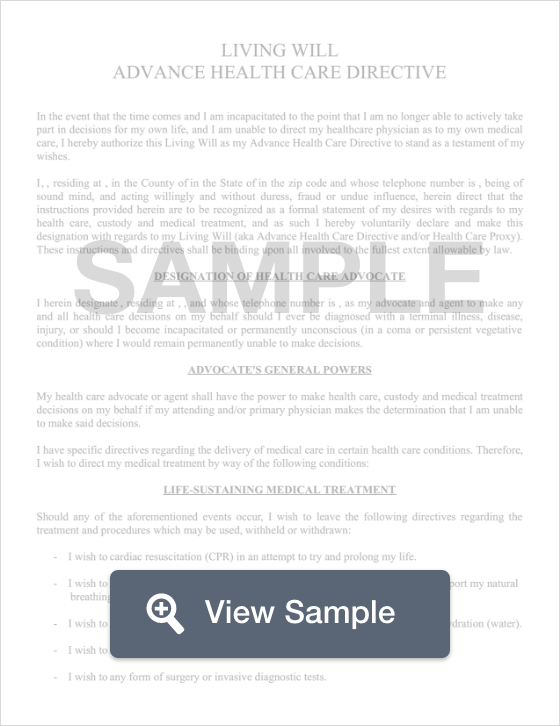 This document is used if you are no longer able to make your own medical decisions. In it, you also name a healthcare proxy. This is a person who you authorize to make your medical decisions. They must be at least 21 years old. A Colorado living will is commonly referred to as a declaration of medical or surgical treatment. A Colorado living will must be signed by two witnesses. Your witnesses cannot be your doctor, an employee of your doctor, an employee of a healthcare facility where you are a patient, a person who could file a claim against your estate, or anyone who is entitled to a portion of your estate under inheritance laws. If you are a patient or a resident of a healthcare facility, other patients may not be a witness in a Colorado living will. § 15-18-101 through § 15-18-113: Known as the Colorado Medical Treatment Decision Act, the Colorado laws for living wills gives a healthcare proxy the power to make medical decisions on your behalf if you’re no longer able to make your own decisions. Unless specifically mentioned in the living will, this document does not allow for the withholding or removal of artificial nourishment. Another important component of making your wishes known for the end of your life is creating a Colorado last will and testament.